There is nothing better on this planet than eating eggs from your own chickens and the feeling that you have livestock. Chickens are not only suppliers of food but will give you hours of pleasure by just watching them. They become just as much pets as Kitty the Cat and Bruno the dog ! 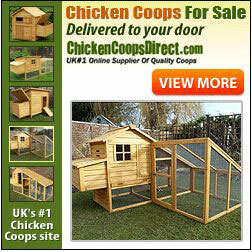 You can easily keep up to 4 / 5 chickens in appropriate size arks or a static coop. One chicken during spring, summer and autumn will probably give you about 4 / 5 eggs a week. Through winter this will halve. Feeding a chicken is not too costly. I have 13 and spend about £4 per week on mixed corn and pellets. This is supplemented by waste food from the kitchen. Also, the neighbours like giving you bits and bobs as well. Still sell the eggs to them though, they don't seem to mind and if you sell them below Supermarket price, they'll be happy and I bet you they will say they are the best eggs they've ever had. To buy chickens you either have to look in the local papers or go to an auction. It's hard to put an average price on a hen. They can cost anything up to £30 if it's a 'thoroughbred', but your normal commonal garden chicken would be between £6 and £8. Personally, I buy ex-battery hens at auction and have paid as little as 20p (yes, twenty pence) each for them. A bit of tender loving care and after a few weeks they're as good as any although you may not get the same amount of eggs as a Lohmann Brown, a light Sussex or Rhode Island Red etc. 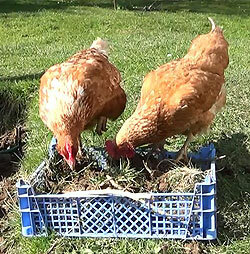 There are a few things which need to be considered about keeping chickens. 1. No matter where you put them, they going to destroy the grass growing there, so if you have an Ark, you need to move it on a regular basis. run at them as soon as they hear the 'pop' ! 3. Foxes rather like them. I don't have anything against the fox, but let him and he'll have them. hens. They aren't really much harm, but will take the food, the bedding and dig lots of holes. chickens and keep the eggs'. I can't start to explain my enthusiasm for keeping chickens. Over a year we eat only our own eggs and through summer sell enough to pay for the yearly chicken food bill, so the profit is probably only in the eggs we don't have to buy. But to see the superior yolk colour, the texture of the eating and the occasional egg you are amazed with by size etc., makes the whole thing a real experience and gives you more a feel of self-sufficiency.